Four well-rugged up cyclists arrived to ride – Tricia and Shane, David F and Helen (leader). It was a cold, frosty morning, but sunny and still. The bay was glassy. Helen at Limeburner’s Lagoon, Hovell’s Creek path. Low tide. David, Shane & Tricia, Picnic rotunda, Limeburner’s Lagoon. 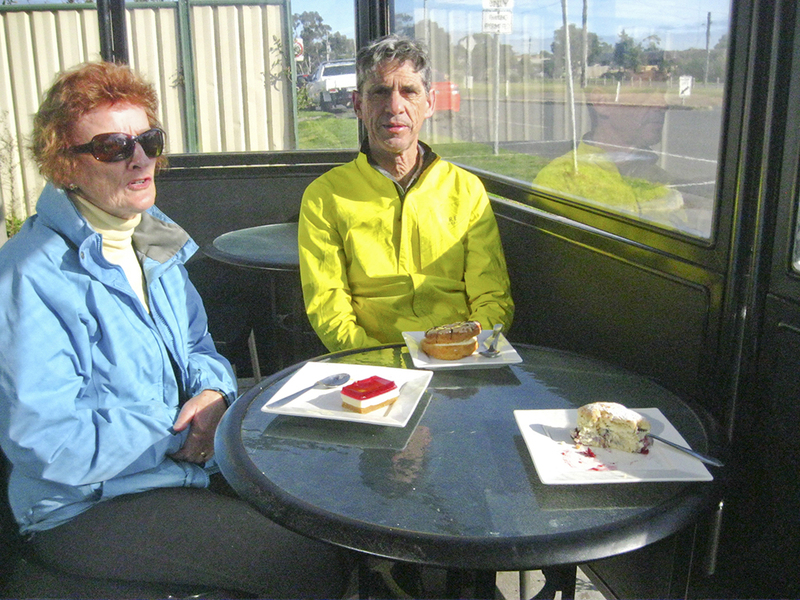 The route was around the coast to Hovells Creek Trail, then to Rod’s Bakery for coffee. By this time a wind had blown up and the sun disappeared behind clouds. A little light sustenance while waiting for coffee. Sustenance was clearly needed for the return. Tricia and Shane left David and Helen to return via Hovells Creek Path. David and Helen continued to the You Yangs via Flinders Avenue. There were mountain bikes everywhere, with a major competition in the You Yangs mountain bike trails. The return from the You Yangs, against a strengthening westerly wind, was along Forest Road, Windermere Road, Bacchus Marsh Road and the Ted Wilson Trail to Church Street. David left the ride at Elizabeth Street for Marshall. This entry was posted in Ride reports and tagged Hovells Creek Bike Path, Rod's Bakery, Ted Wilson Trail by hlyth2013. Bookmark the permalink.